For the first time in weeks, I had a good night’s sleep last night. 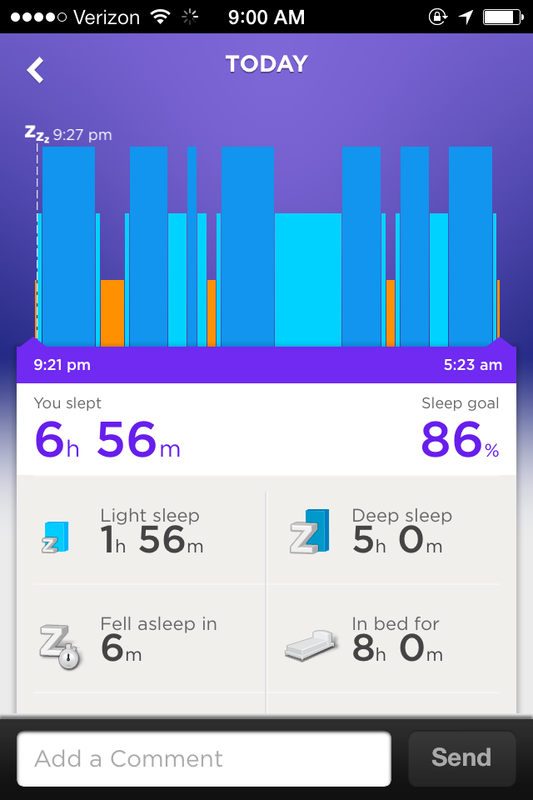 My Jawbone Up reported five glorious hours of deep sleep (plus two hours of light sleep); I haven’t felt this refreshed in weeks. A sight for tired eyes. For some reason, I’ve had a really hard time falling asleep and staying asleep lately. I don’t drink caffeine after noon, I shut down electronics hours before bedtime, I don’t work out close to bedtime (90% of the time), and I’m not particularly anxious or excited about anything. I’ve never had a problem sleeping. I’ve fallen asleep quickly and stayed asleep (minus a couple of trips to the bathroom) for as long as I can remember, so this sleep problem comes completely out of left field. This week, I’ve been reading before bed (books, magazines, whatever) and taking melatonin, which has helped a lot. I think a nightly routine that includes reading in some capacity (preferably sans an electronic screen) may be the trick to turning off my brain for nightly slumber. That has been happening to me for the last few months, not being able to sleep through the night. I don’t know if it’s mental stress or endorphins (still in my body from my morning run?). I’ve always loved to sleep and had no trouble falling/staying asleep. I’ve had similar issues in the recent past. I think that the ‘no coffee after noon’ rule is a really good one and I think that it has helped some. I’ve started waking up super early (on top of not being able to fall asleep right away). I agree that mental fatigue/stress plays a huge role. Sounds like you have made some changes and I hope that they start to work for you soon! I’ve also found that there is a difference when I am physically active during the day and when I am not.